County Superintendent of Schools Dr. Judy White speaks at LEUSD, Feb. 28! A dinner & program invitation from the African American Parent Advisory Council. RSVP Christina Laster, PH 951-266-6911...join us for an inspiring message, "Together We Can!" 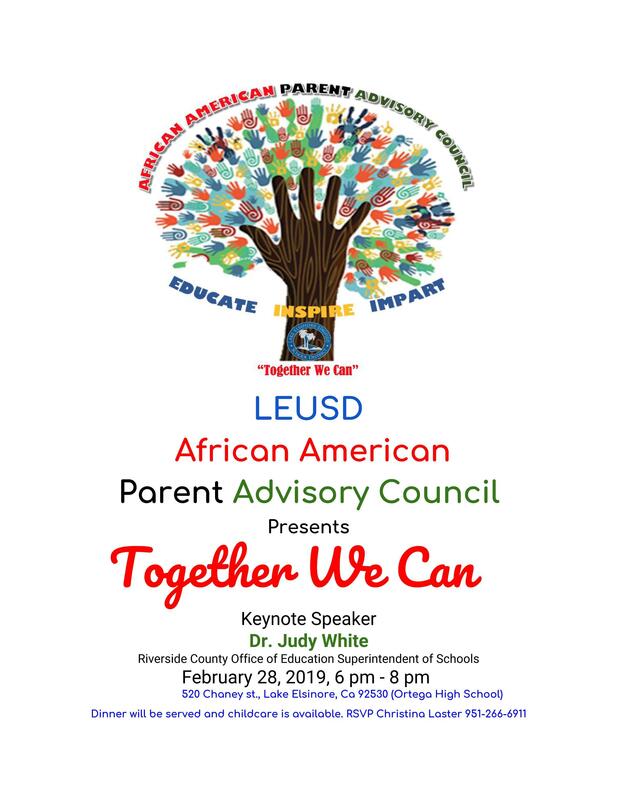 WHAT & WHEN: Wednesday, February 28, 2019, 6 p.m. - 8 p.m., please join us for a program featuring Dr. Judy White, Riverside County Superintendent of Schools, for the keynote address, "Together We Can!" HOW: To RSVP, please telephone Christina Laster at (951) 266-6911. Deadline to register is Tuesday, February 26, so don't delay! * The Lake Elsinore Unified School District African American Parent Advisory Council (LEUSD AAPAC) is a parent-led advisory council that seeks to provide opportunities for parents, families, and community members to be actively involved in planning and shaping of educational achievement access, equity, and measurable outcomes.